Are Josh Reddick and Harrison Barnes going to have a joint scavenger hunt? 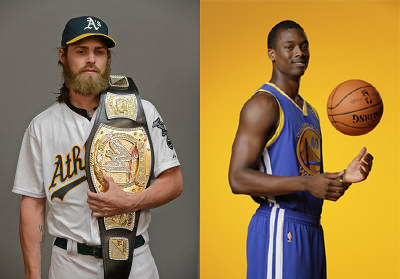 Josh Reddick and Harrison Barnes could tag team in the near future in a scavenger hunt. Remember when Josh Reddick held his own scavenger hunt last week? That caught the eye of Golden State Warriors forward Harrison Barnes. Barnes reached out to Reddick on Twitter about the cards Reddick left around for his scavenger hunt. @joshreddick16 hey bro I heard you were giving away some of your baseball cards. I have some old school bball ones. Wanna trade sometime? Reddick responded with details of why he had all those cards. Then the idea of a joint scavenger hunt came to be. This isn’t the first time that the Bay Area teams from different sports have done things together to support one another. But at times, these are headed up by the public relations or upper management. Having these two stars potentially doing something like this on their own is pretty neat. I hope they go through with it. It’s always a fun way for these two to build a relationship and involve the fans too. @joshreddick16 I've been meaning to get up to walnut creek…you free this weekend? This entry was posted in Golden State Warriors, MLB, NBA, Oakland Athletics and tagged Harrison Barnes, Josh Reddick, Scavenger Hunt. Bookmark the permalink.